I believe every child is an artist and a thinker. My teaching philosophy is to create an environment that builds an appreciation for the Arts and a platform for self-expression. Each person has the ability to express creatively that which defines them as an individual. It is my role as a teacher and a facilitator to help my students connect to themselves and to others through the Arts. Using Twitter: Connecting with other educators, sharing content and engaging in conversation. This collection shares different posts made recently that were retweeted by others, thus sharing the ideas virtually. 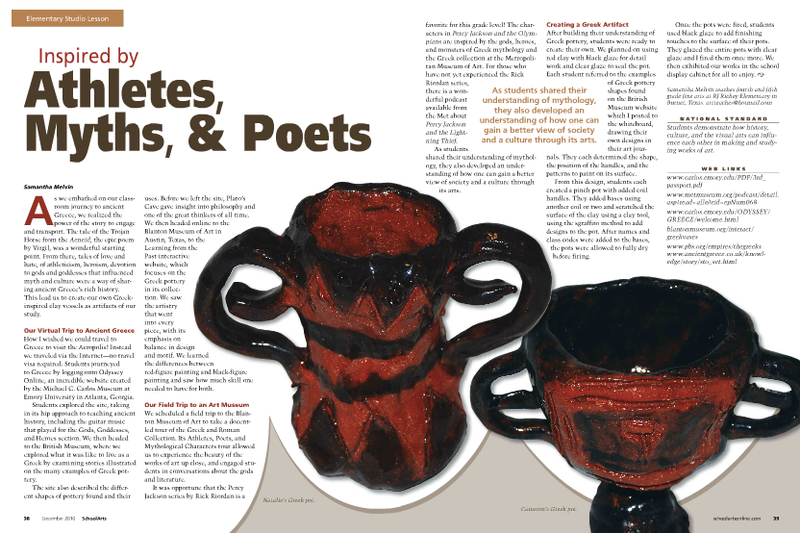 Published from the Studio: One of my favorite lessons which inspires every student, regardless of confidence or ability level, to create wonderful works out of clay was published in School Arts magazine. Our focus on Greek pottery, mythology and art history was complete with our tour of the Blanton Museum of Art's Greek collection. VoiceThread in the Studio: Our Fall Haikus! Here is our example of integrating VoiceThread as a means to connect art, language arts and technology creating a product that can be shared with many. This piece was part of the presentation to the school board and school community--a great way to advocate for Art as well as interdisciplinary learning... something we in the Art field have been doing for a long time. Animoto in the Studio: we use Animoto to share with the community and our school board what is happening in the Studio. These works of art were exhibited at our local post office. 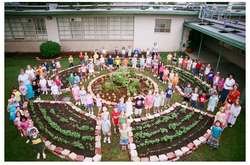 As the art teacher at Hunters Creek Elementary, in Spring Branch ISD, in Houston, I received an A+ for Energy grant from BP which enabled us to install an interactive garden in one of the courtyards of our school. Kindergarteners planted beans, using them for Math, Science and Language Arts, while older grades studied composting, water management and botany. Students created a variety of works of art in response to their studies. This project was the subject of a presentation at NAEA in New Orleans in 2008.